To clinch a $4.1 bln stake in lithium giant SQM, China's Tianqi has agreed with antitrust officials to limit access to sensitive information. A hostile shareholder may yet thwart the deal but as Beijing's clout in the industry grows, such acquisitions will only get tougher. Shares in the London-listed Chilean copper miner slumped after it said U.S.-China trade tensions may hit demand for the metal. Antofagasta had a weak first half, but its guidance is unchanged. Macro jitters mean investors are unwilling to give companies the benefit of the doubt. A government agency wants to block Tianqi Lithium's bid for a stake in $13 bln rival SQM, arguing the market is too concentrated. China seldom gets pushback in resources M&A. Beijing can expect more potholes as it tightens its grip on ingredients for electric vehicle batteries. 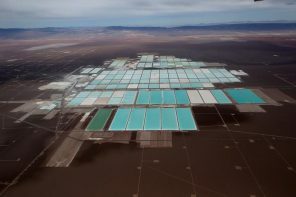 The mining giant is mulling a stake in $15 bln lithium producer SQM. Rechargeable-battery fever has helped lift the Chilean company's valuation to a tech-like multiple. Deals will return with industry growth, but after past mistakes including Alcan, Rio is looking late again. Several countries in the region have shunned leftist populism of late. But the pain from economic reforms in Argentina and Brazil could make voters reconsider, if it's not accompanied by growth. And Chile's consensus on fiscal prudence may unravel. The leftist leader's woes look like a breeze next to those of her impeached coreligionist in Brazil. Chile's corruption scandal, economic slowdown and rising pension crisis are small in comparison, but bad news for the copper producer's status as a bulwark of regional stability. The embattled commodities trader is hacking back production in a bid to reduce its debts. The latest cut could be a fifth of its copper production. Companies with strong, single-minded leaders often choose to shrink rather than change after crisis hits. That leaves them at the mercy of markets. Brazilian lender Itaú has pursued a strategy to create the first truly pan-Latin America financial institution. Its biggest effort to date is at an impasse. The merger it thought it cleverly struck with Chile’s CorpBanca is backfiring in ways that may cost it treasure and face. Latam is exposed to varying degrees to the steep drop in the price of crude. Itaú economists expect Brent to rebound to $70 this year, but the uncertain outlook means Colombia has much to lose. Brazil, Argentina and Mexico can’t afford a prolonged slump. Chile is a clear winner. The Spanish utility will pay $7.6 bln including debt for CGE, Chile’s largest electricity distributor. This increases Gas Natural’s footprint in Latin America, countering weak growth at home. But it is paying more than 10 times 2013 EBITDA with few obvious synergies. Santiago’s securities watchdog levied a $164 mln fine, the largest ever, against the late dictator’s former son-in-law and his cronies. The brouhaha has drawn unhelpful attention to some unresolved Chilean conundrums at a time when the country is struggling to attract investment. The Washington lender’s IFC is hiring an independent adviser to analyze the Brazilian bank’s bid to control Chile’s CorpBanca without paying a premium to minority shareholders. That could challenge the fairness opinions put forth by Goldman and BofA in support of the deal.